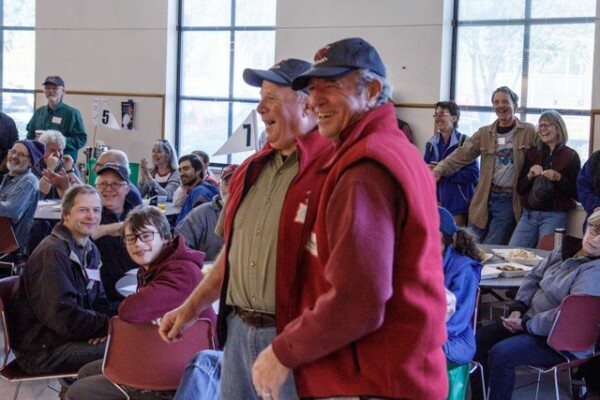 The first weekend in May brought out 400 volunteers for the annual Hearts and Hammers of South Whidbey one-day blitz of home repair and help for neighbors in need. 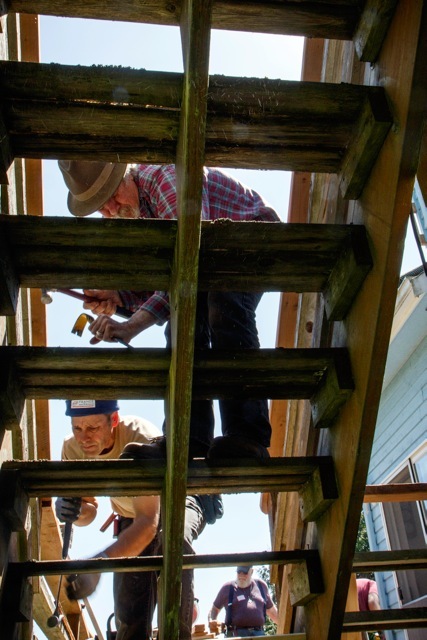 This past Saturday, May 2, these volunteers completed repairs on 32 homes with material donated or sold at cost by local building supply companies. There are many smiling faces in this group shot of the Hearts & Hammers volunteers in the morning after their breakfast and orientation at the South Whidbey High School. Christine Nyberg Epstein takes a turn at the microphone to get the day started. Richard Epstein (standing to the right of Bob Dalton) heckles the speaker with an “I love you,” setting the tone for the day. 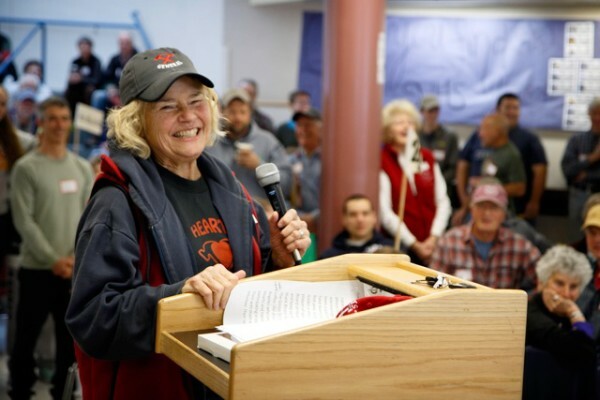 Lynn Willeford, pictured to the right of her husband Blake Willeford, founded South Whidbey Hearts and Hammers in 1994. Although she has retired from the board she still participates in the workday each May. 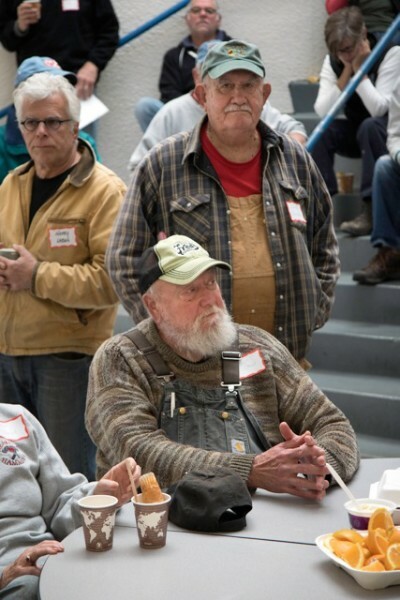 Fred O’Neal and many other talented workers prepare for their day over breakfast. Prepping for the day. 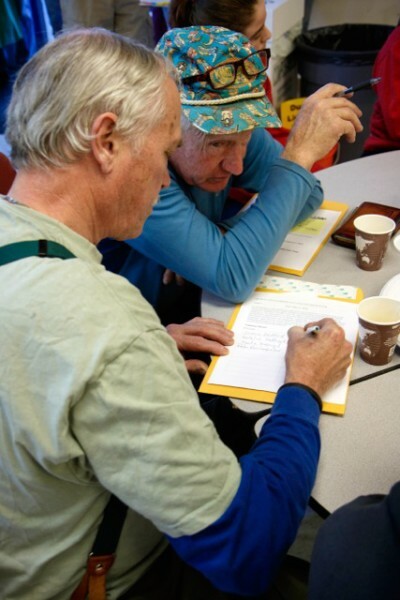 Ricky Knickerbocker is going over the TTD list at his crew’s jobsite. 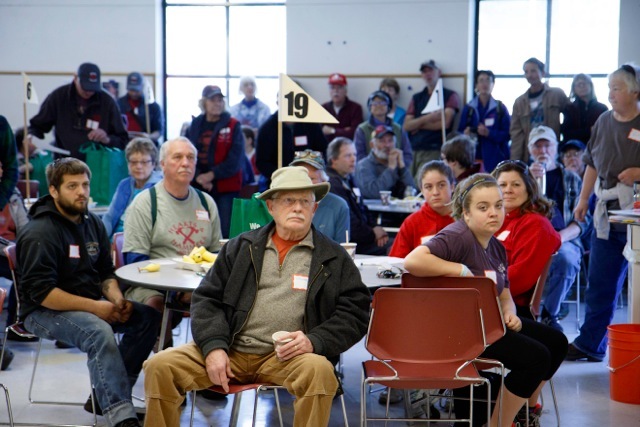 The volunteers listen to instructions before starting their day. 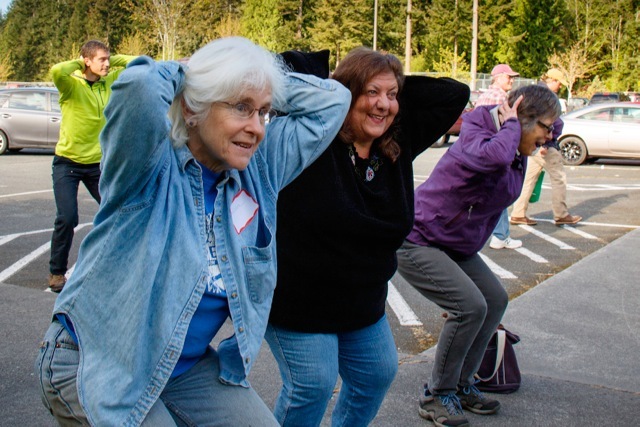 Melissa Young and many others participate in the warm-up exercises. 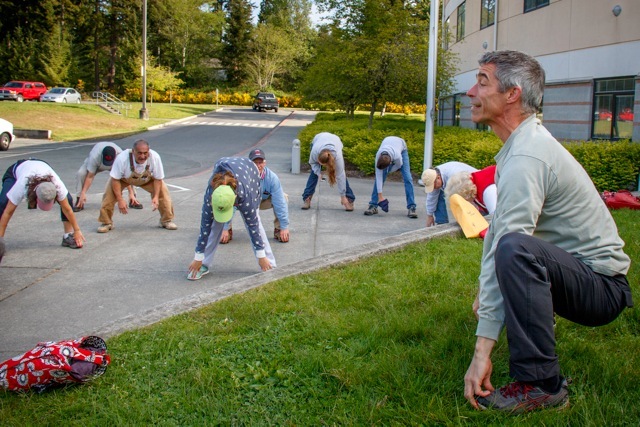 Adam Fawcett leads the stretching exercises to help prepare the crews for all the bending and kneeling during the day. 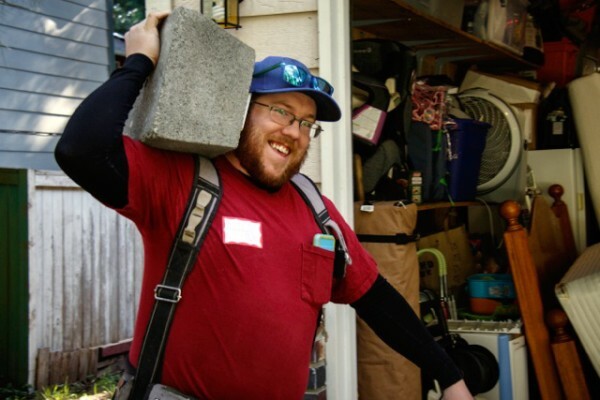 Aaron B. is carrying the concrete block that will support new shorter steps to allow easier access to the front door for toddlers. 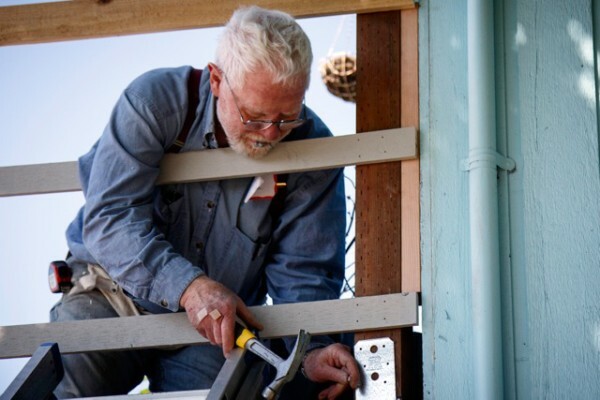 Volunteers perform many tasks, not all of them requiring heavy lifting! And fixing stairs. 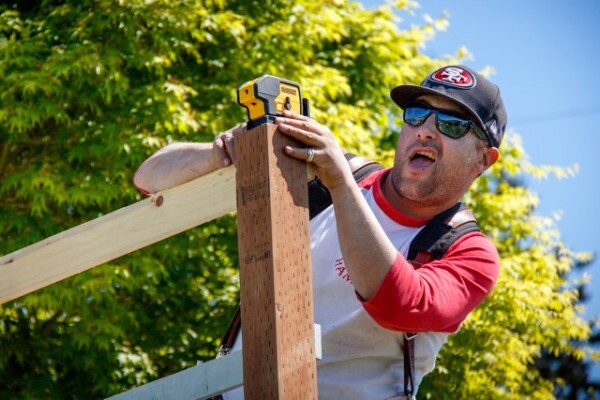 In addition to carpentry, crews also do plumbing and electrical repairs, painting, weatherization, roof and gutter repair, yard cleanup, and trash removal, and the installation of wheelchair ramps, railings and grab bars. 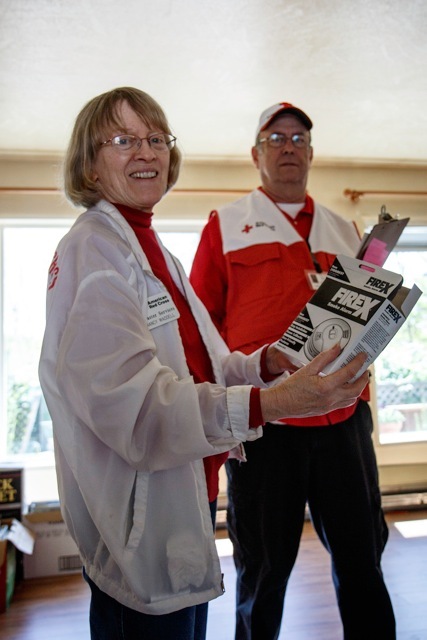 Nancy Waddell from the Red Cross provided many new smoke detectors. 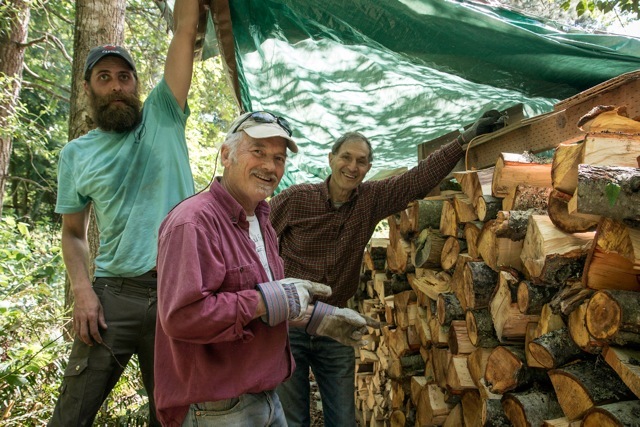 The industrious team of “woodchucks” fill up many local wood piles. 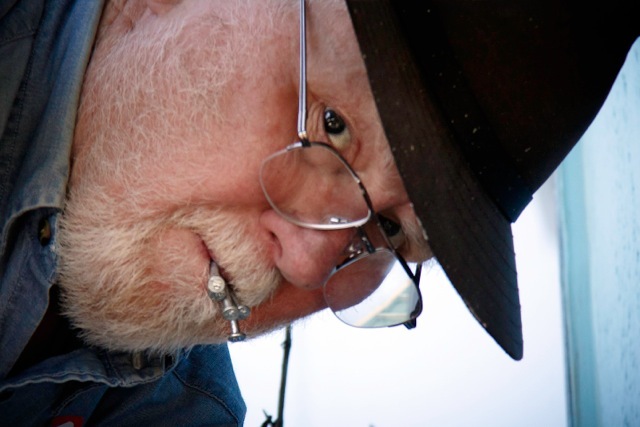 Tom Fox, with nails in his mouth and bandaids on his hands, helps repair a deck. And the work that’s done is done right and with a smile. 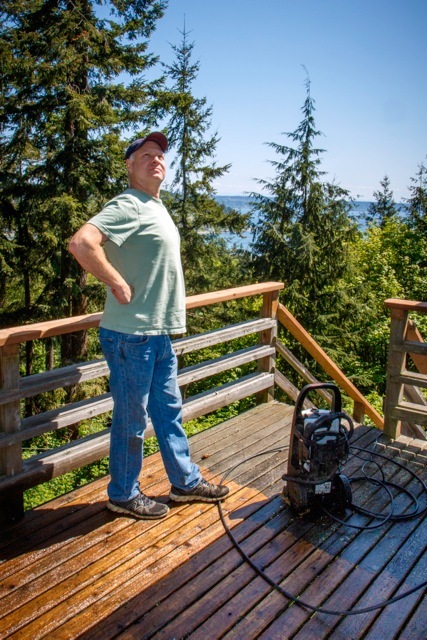 A laser sight is used in replacing an unsafe and rotting clothesline deck railing with a safer structure. 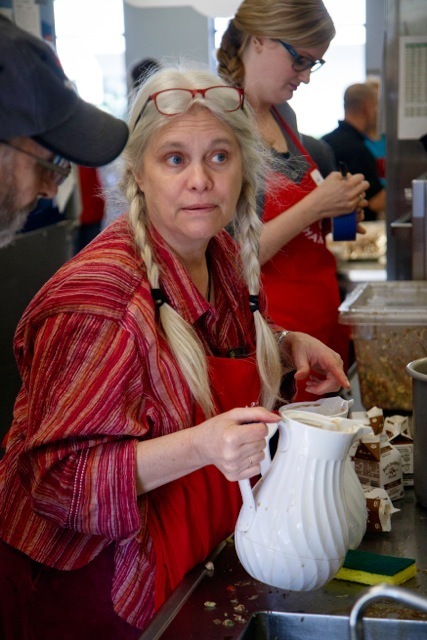 Shellie Moore supervised the kitchen crew, who prepared a fabulous meal for the famished crew who returned to the high school for dinner and entertainment after their work was completed. 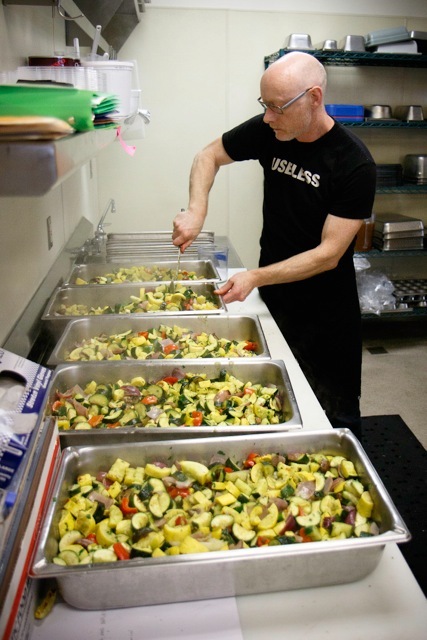 Des Rock of Useless Bay Coffee Company prepares delicious food for the crews. 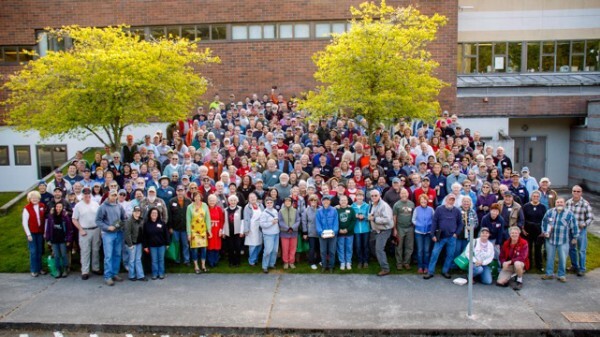 Hearts and Hammers of South Whidbey Island is a local non-profit organization of neighbors helping neighbors. 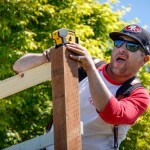 Find out more about the South Whidbey Hearts and Hammers by visiting their website at: http://www.heartsandhammers.com. 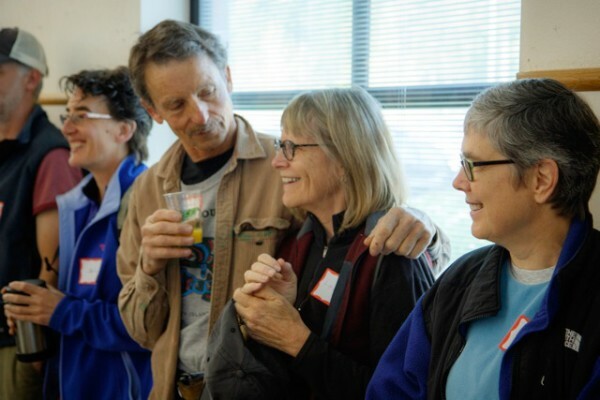 This event also takes place in Central Whidbey, find out more here: http://cwheartsandhammers.com.